A parcel landed on my doormat this morning. Gear heads will all know how good that feels. To say it's addictive is an understatement. This one was a real windfall. A rare bit of good fortune. A prize in a draw and, unusual amongst things won, something I realy want to own. 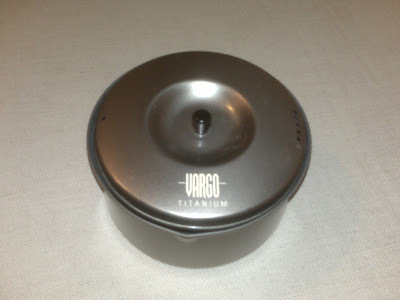 Enjoying the anticipation, opening the box with care, I uncovered a lovely little anodised titainium pot and lid. Non stick to boot. Damn that Vargo kit is well made. Refined with non of the fresh-out-of-the-chineese-foundary look of my bargain basement Ti cookware. The lid actualy fits the pot. Feather light, at 111g, this little beauty will first take pride of place on my gear shelves and later (not much later by the look of things), will get a serious run out. I'm very grateful for my good fortune, very grateful to Philip Werner (better known as Section Hiker) for his kindness, effort and expense and hopeful that a little of my good fortune rubs off on the sender! I've had one of these for a while now and it is certainly a good piece of kit. One tip: if you have any Locktite Threadlock, or similar, put a few drops on the threads of the screw that holds the lid knob on, otherwise it will tend to work loose.